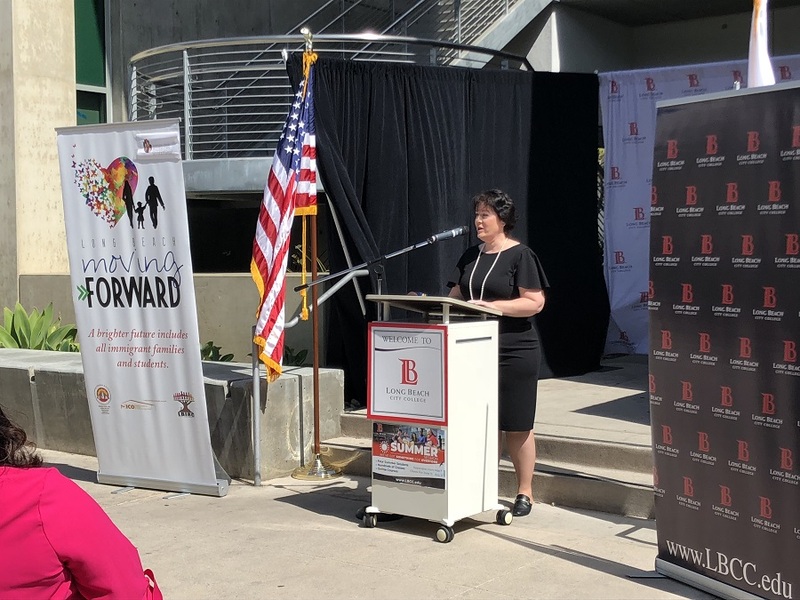 LBCC Superintendent-President Dr. Reagan Romali speaks during a news conference Wednesday morning promoting the Long Beach Moving Forward Resource Fair. Photos by Stephanie Rivera. It’s been less than a year since 24-year-old Long Beach Josefina Cruz and her family became U.S. citizens, after being legal residents for eight years. Since becoming citizens, Cruz said her parents feel more incorporated into the community and a sense of security they hadn’t felt before. While Cruz’s father had a job and provided a sense of stability for the family, at age 51, she said he was heartbroken over deciding if the family should uproot and move to America. The decision was made easier, however, when he got a phone call that made him fear for his children’s safety. Since coming to the U.S. and becoming citizens, the status has also allowed Cruz and her two younger brothers to not only receive the opportunity to finish school but also be afforded the choice to choose the career they want—noting that some companies require employees to be citizens. A graduate of LBCC, Cruz went on to earn her bachelor’s degree in psychology from UC Riverside last year and moved back to Long Beach where she now works as a case manager at Centro CHA, a local nonprofit social services agency. Josefina Cruz, a 24-year-old Long Beach resident, talks about her family’s experience becoming U.S. citizens. 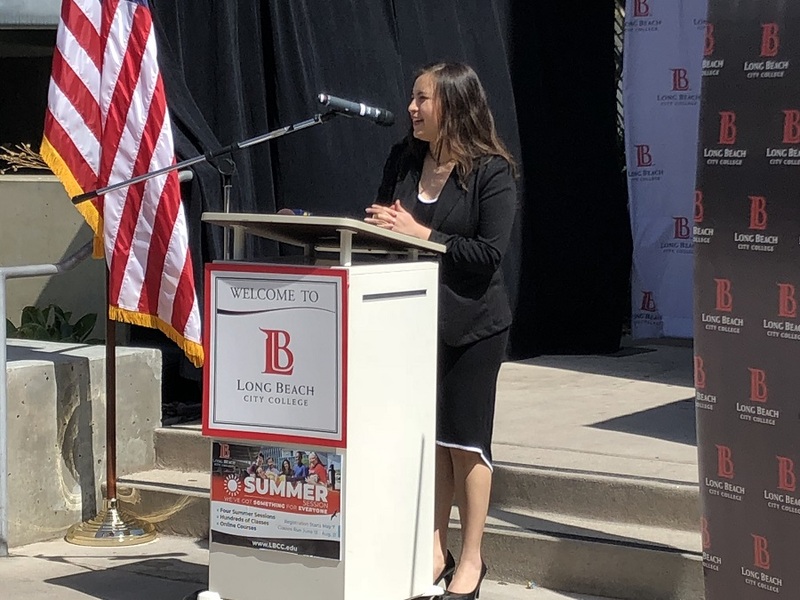 Cruz shared her story at a news conference Wednesday morning promoting the third annual Long Beach Moving Forward community resource fair to be co-hosted by Centro CHA at Long Beach City College this Saturday. While this is the third time Centro CHA and LBCC have hosted the event, it will be the first time the entire community is welcomed to go and take advantage of services. The free event will include workshops on citizenship application assistance, undocumented in higher education, LBCC admissions and enrollment, FAFSA and the Dream Act, immigration attorney, career technical education, degree to employment and knowing your rights. The event is funded by the state Department of Social Services and is also in partnership with Cal State Long Beach, UC Irvine, Long Beach Immigrant Rights Coalition, Citibank and the Greater Long Beach interfaith Community Organization. The event will take place Saturday, May 12 from 9:00AM to 2:00PM at LBCCs Pacific Coast Campus, located at 1305 East Pacific Coast Highway.